Every dog needs one of these awesome beds for maximum coziness. Don’t get me wrong, I absolutely love snuggling with my pets — during the day. 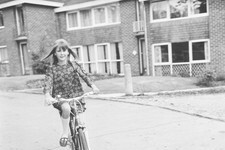 At night, I’d rather they sleep in their own beds and not in mine. If you're looking for a way to keep your dog cozy at night so they stop waking you up (or suffocating your legs), you need to find a dog bed for your canine BFF right this minute. The search for the perfect dog bed can be hard, though. First, you need find a pet bed they like. If your dog’s bed isn't comfy enough, they won’t use it, or worse, they might chew it into tiny pieces across your living room floor to express their canine discontent. 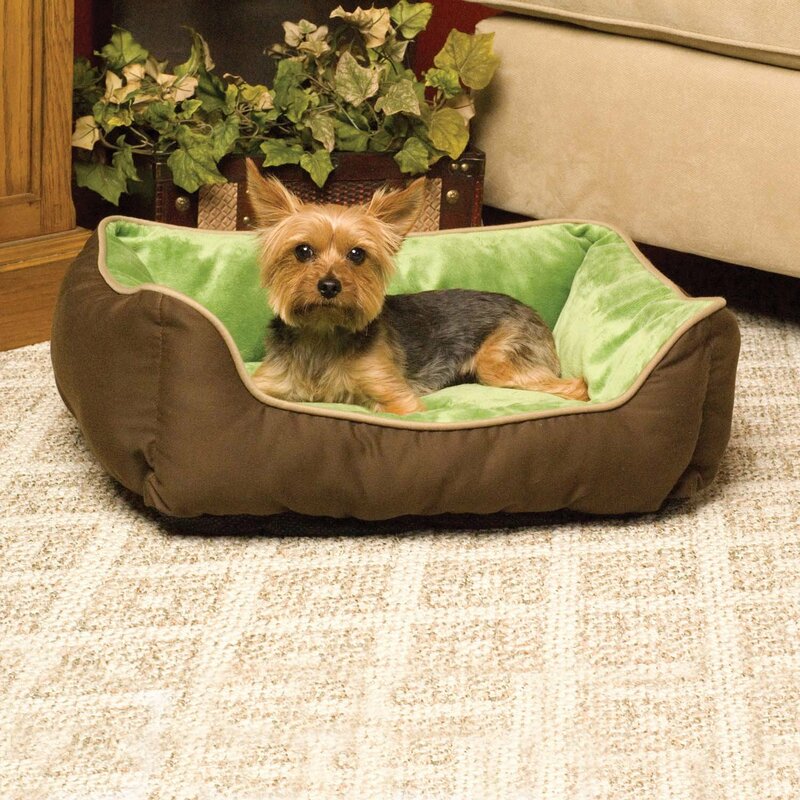 The perfect dog bed is also easy to clean and it's sturdy enough to handle your playful pup or calm senior. Make sure to pick a dog bed that is the right fit for your fur baby, your home, and even their crate, if that’s where they sleep at night. Lucky for you, dog beds come in all shapes and sizes — square, round, and even cave-shaped — to cater to your pooch’s instinctual need for peace and quiet (and match with any décor). If you’re looking for a dog bed that won’t hurt your wallet, your best bet is shopping online. Chances are you'll find a great dog bed for your beloved pup. How do you know that it will be comfy and warm if you can’t see it or feel it in person before you add it to your shopping cart? To make your dog parent life easier, we’ve scoured the web for the highest-rated, pup-approved dog beds to take the guesswork out of online shopping and save you some time to spend with your dog. If you're in the market for a new dog bed to help ensure you both get a good night’s sleep, read on. You may also want to bookmark this page so you can find it later on. Happy hunting and here's to a better night of zzz's! There's not a sure-fire way to keep your dog off your bed, but the Best Friends By Sheri Luxury Donut Cuddler is so nice, you might actually have a shot. 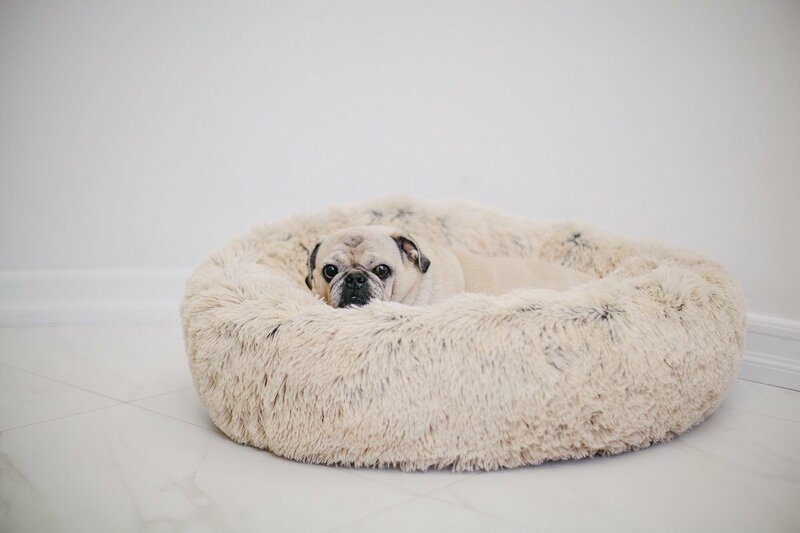 Designed for dogs who like to curl up to sleep, this dog bed is covered in a luxurious faux fur shell that comes in taupe or grey and can be removed for machine washing. It comes in three sizes, from 23 inches for tiny toy breeds to 45 inches for large dogs up to 150 pounds, and features a soft yet supportive cushion/donut shape to give your dog a good night's sleep. Priced from $34.99 to $129.95, it's no wonder the Best Friends By Sheri Luxury Donut Cuddler is one of the best-selling and highest-rated dog beds on Amazon. For an adorable unboxing video featuring corgi Gatsby trying out this bed, check out this YouTube review. One enthusiastic five-star reviewer wrote, "Our 11-pound Chihuahua, Lucy, absolutely loves this bed! It took her a few minutes to get used to this new thing in her life, after we first introduced her to it, and now she practically lives in it! We bought the small size. It’s incredibly soft and well padded on the sides and the bottom. The interior edges are deep enough that she can “burrow” into them. 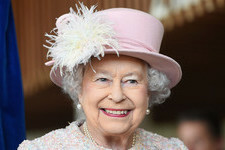 She’ll often put her leg(s) or head into that area. It’s as comfortable when placed on our hardwood floors as when it’s on the sofa. I’ve posted pictures of Lucy enjoying her bed on Facebook and Instagram, and already a few friends are going to order one for their own dogs. If they came in human size, I’d be tempted to order one for myself!" 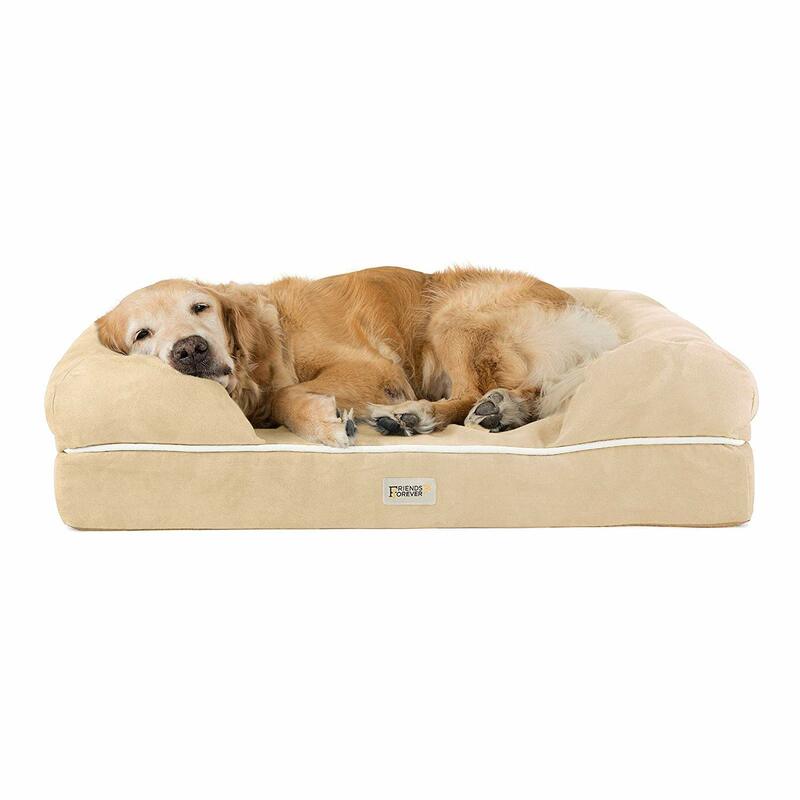 If you love your own memory foam mattress and want to treat your dog to an equally awesome night's sleep in their own bed, the Better World Pets Super Comfort Bolster Dog Bed is a great choice — especially for senior dogs or for dogs with arthritis who need a more supportive bed. This free-standing dog bed has a canvas cover that's machine washable and waterproof to prevent urine and drool from soaking into the mattress. The bed comes in three sizes — small (one to 25 pounds, priced at $95.77), medium (25 to 60 pounds, priced at $138.77), and large (60 to 100 pounds, priced at $164.77) — and two color options in white and grey. While this price range might seem expensive for a dog bed, considering its five-star rating on Amazon and one-year, full-refund warranty, you really have nothing to lose but a dog in your bed. If you live in a cold climate, you might want to check out the K&H Pet Products Self-Warming Lounge Sleeper Pet Bed. This dog bed features a two-layer fabric cover that actually absorbs and radiates heat, keeping your pooch warm in the winter without having to be plugged in. Priced at just $20.99, the small-sized bed measures 16 inches by 20 inches and the entire bed can be washed when it gets dirty. With over 1,200 five-star reviews on Amazon, you know it's got to be awesome. As one enthusiastic customer wrote, "I bought one of these beds from the store for our tiny puppy and he loved it so much!! When we took in two rescues, I went in search of the same bed. Ended up finding them on Amazon for a much better price so I ended up buying two more. Now they each have their own beds. The fabric inside is very soft and my dogs always seem to be warm. My favorite part about these beds is that I have washed and dried them in the washer and dryer with no problems. They come out just as soft and fluffy every time. So convenient to be able to machine wash them." 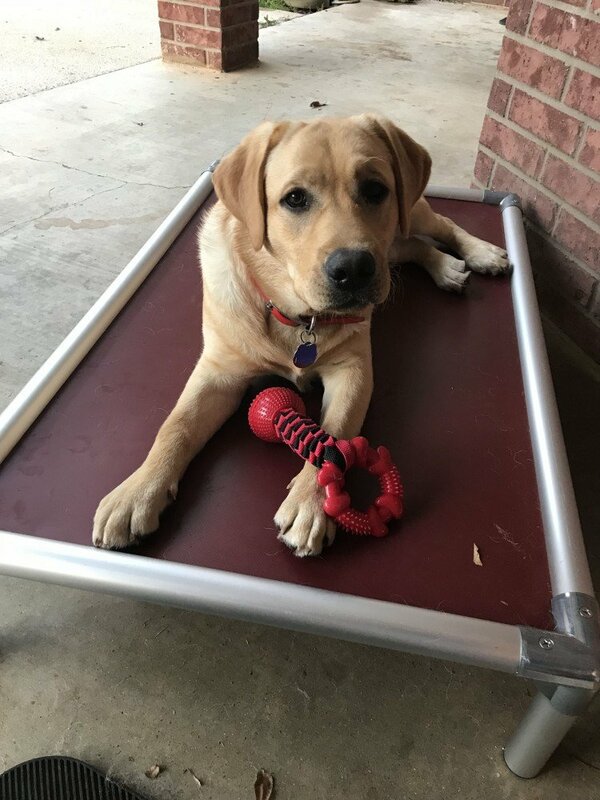 For a dog bed you can use inside and out to keep your pet cool and clean in all types of weather, check out the Kuranda Chewproof Dog Bed. Like its name suggests, this dog bed is great for dogs that chew. Its aluminum frame and smooth vinyl fabric are easy to wipe down or hose off and it can support dogs up to 250 pounds. This durable bed comes in six sizes and four colors and is priced from $110.95 to $169.95. For a high-end dog bed for large and extra-large breeds, check out the Big Barker Orthopedic Dog Bed. Designed especially for massive doggos, this bed comes in large, extra-large and giant XXL sizes perfect for labs, newfies, or great danes — or even two large dogs who like to share a single bed. You'll love its machine washable cover, which comes in burgundy, charcoal grey, khaki, and chocolate brown. While it's definitely on the expensive side from $239.95 to $399.95, the Big Barker offers a 10-year warranty and promises to maintain its shape and never flatten, or your money back. 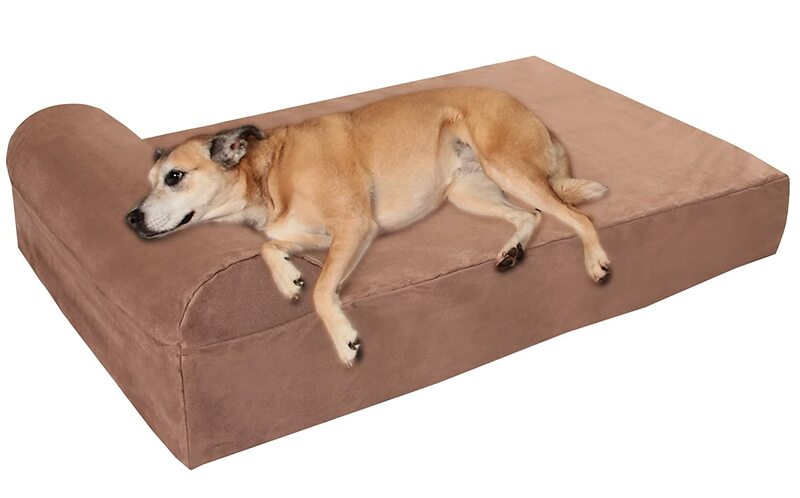 Even better, this dog bed has a 4.9 out of five rating on Amazon with over 3,300 reviews, so you can rest assured it's a good product. In fact, Buzzfeed claims this dog bed is so comfy, it might actually be nicer than your bed, and since it measures at 60 by 48 inches, you can probably snuggle with your pooch to find out. For an easy-to-clean bed for small and big dogs alike, check out the Pet Fusion Waterproof Dog Bed. This mid-range dog bed comes in small (25 inches by 20 inches, $69.95), large (38 inches by 20 inches, $119.95), x-large (44 inches by 34 inches, $179.95, and XXL jumbo (44 inches by 34 inches, $239.95). You'll love the water-resistant cover that you can throw in the washing machine and the waterproof liner that protects a memory foam core. Your dog will love its soft, supportive bolsters, and generous size (up to 200 pounds). The Pet Fusion Waterproof Dog Bed comes in chocolate brown, slate grey, and sandstone, and sports a respectable 4.6 out of five-star rating on Amazon. As one satisfied customer wrote, "We purchased the Large Brown bed less than a month ago for our two dogs to share and it was the perfect size. For reference, our dogs are full grown at 10-15 lbs each. They both have enough room to sprawl out comfortably and they love it. What I personally love most about this bed is that you can remove each part - the bolster, memory foam base, water-resistant liner (for the base) and the actual cover. This makes washing it a breeze." A lot of dogs like to have their own cave (or wolf den) to sleep in at night so they can feel safe and secure. 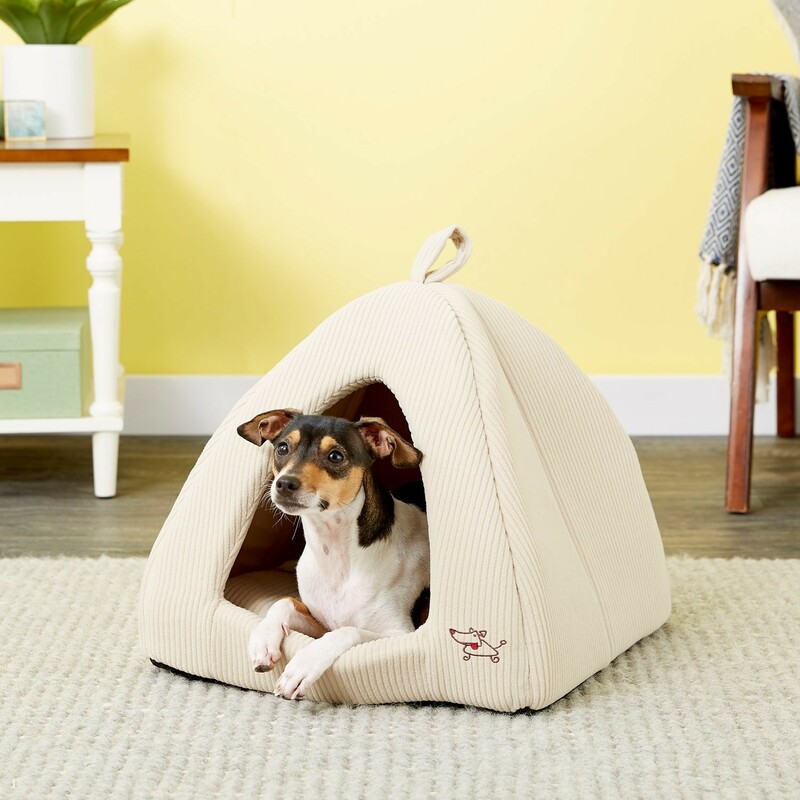 The Best Pet Supplies, Inc. Pet Cave provides an affordable pet bed for small and mid-sized dogs who like to hide or who suffer from separation anxiety. Your dog is sure to love its plush interior and cave-like structure and you'll love that you can throw the entire bed in the washing machine when the time comes. Priced from just $22.99 to $35.99, this bed comes in four sizes and 14 colors to match any decor. One Amazon reviewer writes, "Great for skittish dogs! My 35 lb dog likes it! She is a rescue dog who likes the safety of being under a bed, under a blanket hanging off of a couch, or under a table." 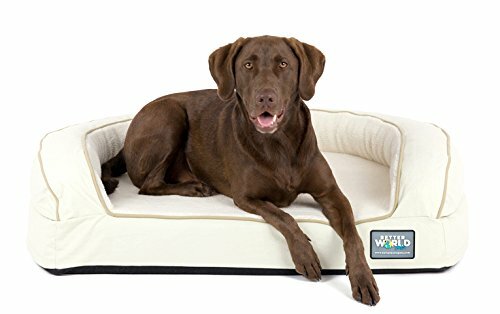 For dog parents on a budget, this AmazonBasics Padded Pet Bolster Bed is priced from just $15.99 to $27.99 and fits most dog crates up to 48 inches. 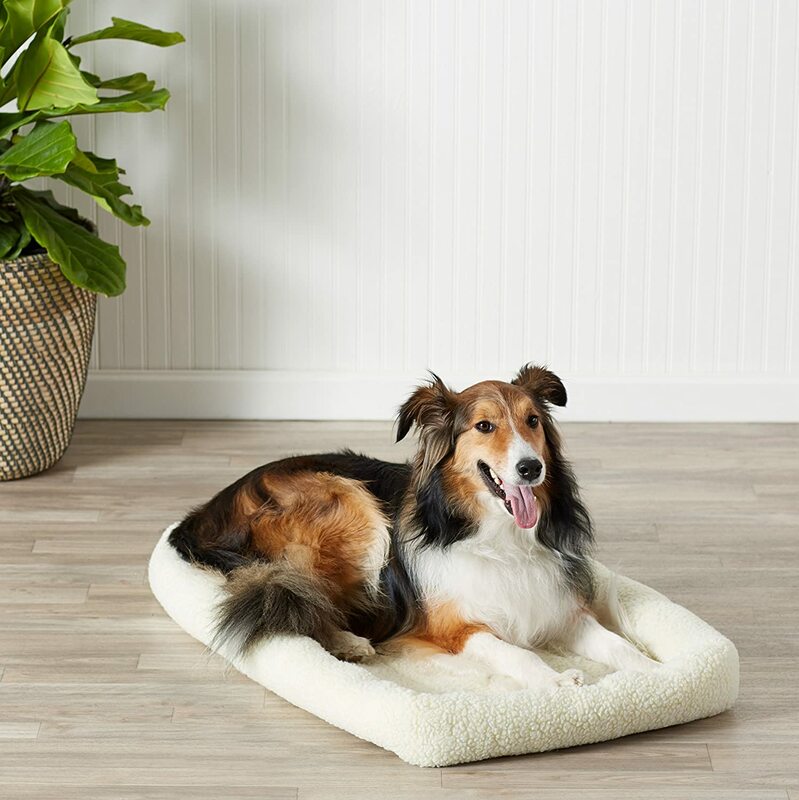 Featuring a machine-washable soft fleece cover and supportive rim for your pooch to rest their head, this basic dog bed gets the job done at an affordable price. One five-star reviewer warns that your dog may not want to sleep anywhere else: "Our dog loved this bed so much that we bought two. One stays in his crate at all times, the other one is mobile throughout the house (and on the road). In hindsight we created a monster, because he no longer wants to lay down anywhere without it and cries when we wash it. We wash this bed weekly and dry it on low heat in the dryer, even though the instructions say to air dry. 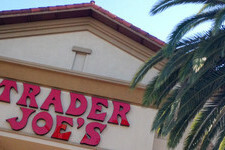 We've never had any problems – the product is quite durable and has kept it's shape nicely." 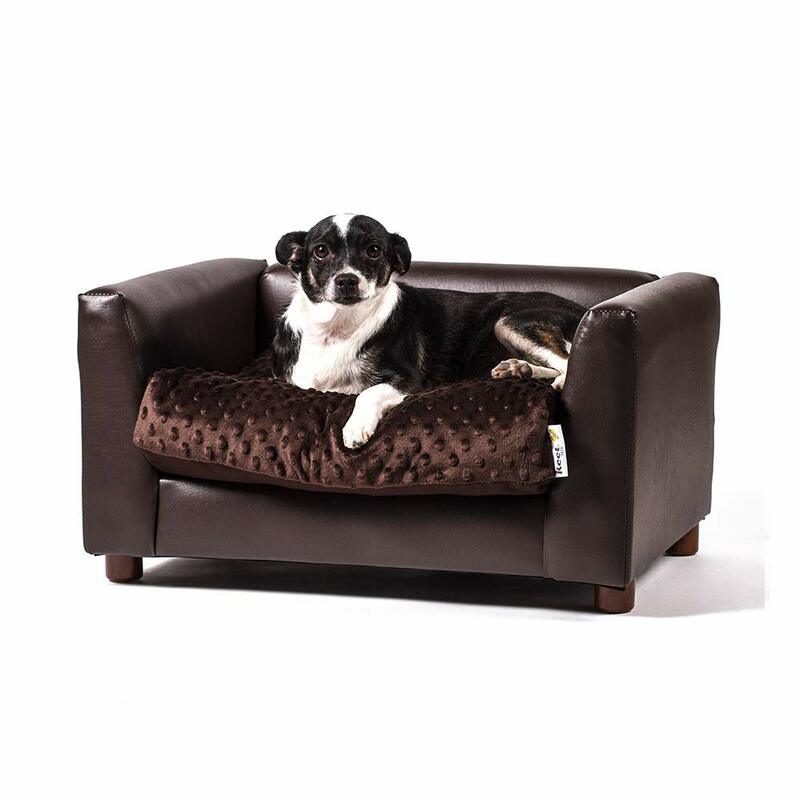 Dog parents with discerning taste should check out the Keet Fluffy Deluxe Pet Bed Sofa. This adorable pet bed come in three sizes to accommodate dogs up to 40 pounds and in two colors to match any decor. It looks like a miniature sofa! Ideal for tiny to mid-sized breeds, this dog bed combines form and function and is priced from just $57.39 (small) to $149.99 (large). As one dog mom writes, "My dog LOVES this bed! It’s is super sharp looking and the bed itself is almost like memory foam. Super comfortable!! I was really hesitant to purchase because I was worried it would be cheap and tacky but I’m in love. I’ve had it a while now (6 months, maybe more) and there isn’t even a scratch on it." The Friends Forever Orthopedic Dog Bed has many of the same features as high-end dog beds: a firm foam mattress to provide a comfy spot for older dogs to rest, a soft, machine-washable cover (in grey, brown, and cream), and a non-skid bottom. It also claims to be tear and pet hair resistant, which might make this the ideal choice for pet parents of dogs up to 130 pounds. At a lower price from just $66.99 to $238.95, this dog bed will deliver a good night's rest for your dog — and you. As one satisfied customer raves, "I know how frustrating it is to find a quality dog bed! And, how disappointing it is to invest money into one that doesn't hold up. Ugh! For these reasons I want to share my experience with my "Friends Forever" purchase in hopes that it will help someone else. This is by far one of the best dog beds I have ever purchased and at a good/fair price for the quality."